GOAL SWANSHannebery marks the kick back from the forward pocket by Kennedy and he kicks the goal that puts Sydney in front. Both Wells and Kennedy have 7 disposals for their respective sides. GOAL SWANSGoodes handballs to Bolton who kicks it over his shoulder off the tight angle with the footy bouncing favourably. BEHIND KANGAROOSTarrant takes a sliding mark after initially having his back to ball. From 40 metres out he hits the post. GOAL KANGAROOSHansen marks at the top of the square. He stutters and shuffles as he lines it up to kick the goal. North Melbourne lead by 10 points. BEHIND SWANSKennedy kicks to the forward pocket but it doesn't bounce for Hannebery and McMahon punches it through for a behind. GOAL SWANSBolton shakes off his opponent, spins, steadies and kicks the first goal for his team. 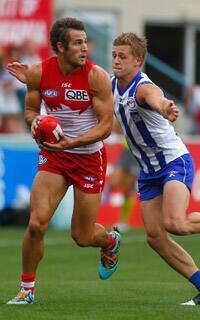 BEHIND SWANSReid tries to dribble it along the ground, but it bounces across the face of goal for a behind. Both defences are on top at the moment with no easy kicks out there. It has been a scrappy start to the match with repetitive ball ups the order of the day. BEHIND SWANSReid with an opportunity 15 metres out and McMahon comes in the nick of time to affect the bump to put him off. A behind results. BEHIND KANGAROOSHansen takes a good mark out in front of Richards but his kick starts right and stays right. North Melbourne have made a very good start against the reigning premiers but we have seen it before. GOAL KANGAROOSCunnington makes a lie of his small man status and flies to take a good strong contested mark. He goes back from 45 metres out and squeezes it through for a goal. Goodes fends off with a high arm and kicks for goal, but the shot is as wild as the fend off and it goes out of bounds on the full. GOAL KANGAROOSA lack of discipline by Mumford gifts Goldstein the free kick at the centre bounce. 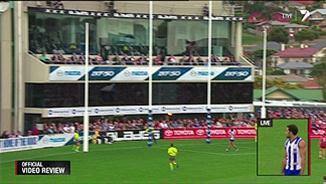 Goldstein is then paid a 50 metre penalty and North Melbourne have a goal within a minute. Welcome to Blundstone Arena for North Melbourne vs Sydney. We are off and underway in Hobart. A late change for the Kangaroos with Anthony out with a knee injury. He is replaced by Harper. 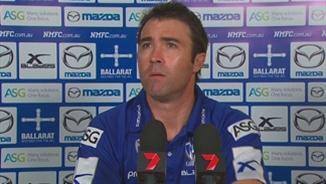 Wright will be the sub for North Melbourne. Welcome to Blundstone Arena for the North Melbourne v Sydney Swans Round 3 clash. 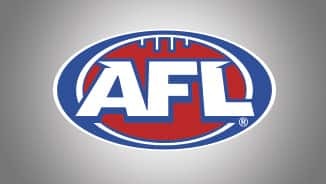 AN astonishing 11-goal third-quarter blitz from Sydney stunned North Melbourne before the AFL premiers ran out 39-point winners at Bellerive on Saturday. The Swans stamped their credentials for back-to-back flags with a 20.11 (131) to 13.14 (92) victory after the Kangaroos had led by 14 points at halftime. Ben McGlynn booted his three goals and co-captain Jarrad McVeigh his two in the premiers' third-quarter ambush, continuing North's winless streak against Sydney since 2007. 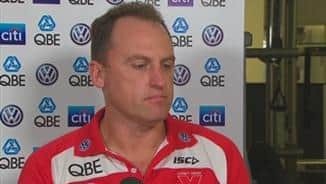 Demoralised North Melbourne, who let Geelong run them down from 41 behind last weekend, are 0-3, while the Swans are unbeaten after early-season wins over strugglers GWS and Gold Coast. The Kangaroos were impressive early and led by four at the first break and 50-36 at halftime. But they had no answers as the premiers hit the accelerator to go to the final break ahead 106-59. North tried to salvage something and booted the first three goals of the last as the Swans' pressure eased off, but it was too little too late. Jude Bolton finished with four for the Swans, his first three coming at crucial times in the first half to keep his side in it, while Daniel Hannebery kicked three and Adam Goodes and Luke Parker bagged doubles. 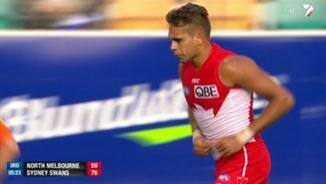 For the Kangaroos, Lindsay Thomas booted three and Lachlan Hansen, Robbie Tarrant and Ben Cunnington two each. 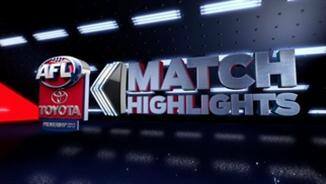 Bolton had two by quarter-time but the Kangaroos led 26-22 after booting four majors to three. The Kangaroos looked in control as flowing movements resulted in the first two goals of the second term through Thomas and Tarrant. But in a near carbon copy of the first quarter, the Swans hit back with consecutive majors from Bolton, who bent a snap superbly, and Parker before Tarrant's second made it 50-36.